Pickle Barrel is open through Friday evening at my shop at Pickleberrypop. I have a smaller than usual package this time. Your can grab the 4-Pack for $4.00 or the different packages for $1.50 each. This is part of series I have been working on for about 3 years. Great for everyday and vintage/heritage type layouts. Also don’t forget Pickleberrypop offer. Check out a couple of the layout the Creative Team did. Man 12th years online Birthday celebration – That’s a long time. I am proud to have been there about 1/2 of that time. There is so much going on this month but you need to watch dates – as you don’t want to miss any of the goodies and fun. So lets start with the Lolly Bags! I have two – one of which is only be sold during the Lolly Bag Sale – so don’t miss it. Well don’t miss either because the prices are amazing. Here are a couple of layouts and you can find more on my Facebook Page and in the gallery. Next up the second Lolly Bag! Which only be offered during this sale. Don’t forget the Wish for it Weekend – we all like wishes granted! Also I am hosting a template challenge and hope you will come play along you can find it in the Pickleberrypop Forum. And if you complete all the challenges you get the Free August Mojo Product. Hope you all have a great week and weekend – Come celebrate with us. Just a small set of frames with masks! 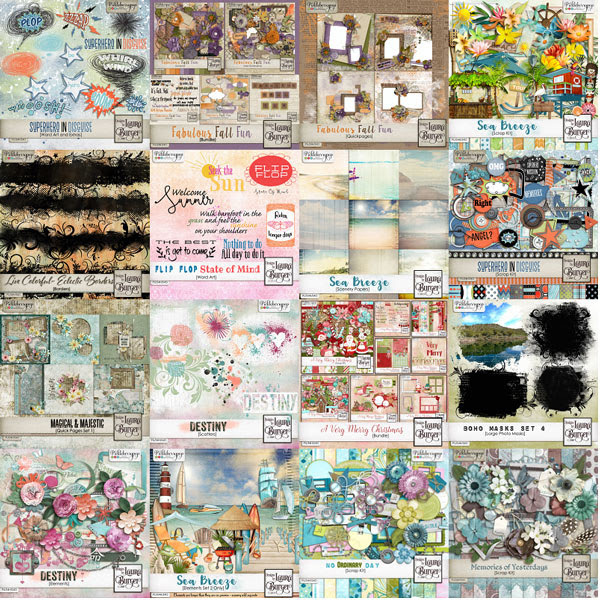 I love these products – so easy to make a quick layout that has a bit of flair. You can find this at my Pickleberrypop shop and on sale for a limited time. Here are some fun layouts using this product. Have a GREAT week ahead of your and hope your are enjoying your summer unless you are elsewhere than the states. Okay I know it is not April Fool’s but it time to retire a bunch of products at Pickleberrypop. I will still be designing, just making room for new products. So this is your lucky few days to grab products before they are gone and at a 60% sale. Products will disappear after July 2. Here is just a sampling of what you might find in the shop on retirement. There are tons of products that are leaving so do make sure you grab before they are completely gone for good. Enjoy your week and I will be back before you know it with new products.